I think I see what you mean. the partition can be seen in disk management but cant be mounted for read write. Yes, I think that you miss the reparse points located in C.\ (pointing to install.wim) when you make the copy using Aconis. We need to recreate them, to do that first thing is unprotect (temporary) Images directory, then start from # 3 in https://technet.micr...y/dn605112.aspx to make new pointer files from the Windows partition to the Images partition. Hadnt heard of reparse points before. Could be the reason why it wont boot into Windows. So acronis 2014 missed it. I wonder if v2015 would have done better. I did a full disk backup not a partition backup. So we know what we need to do, now the next question is how we are going to do it? I think cdob can help you better than myself to do required steps, as he has done this in Windows way before ( http://reboot.pro/to...e-2#entry183839 and the next post), because WinNTSeptup is not the best tool right now. This is a good chance to learn how to deal with corrupted Wim Boot for all of us, please keep us informed. The install.wim i copied to the usb is not recognized by WiNTSetup as a source. hope cdob comes around to read this. I Wonder if when skyide gets his meegopad he can boot into Windows and create a drive backup and we can use that to get this one backup. Similar to what is done in this video. That or find a way to completely backup the whole drive. Let's hope it is not corrupted, and you can send a PM to cdob asking for help. posted on the thread you mention. Will pm him too. So what you say skyide you up for post #55? Temporarily installed windows 8.1 x86 enterprise Evaluation. boots up fast. Well, a lot of unknown parts. I would start at a basic level and collect some informations first. Boot a windows 8.1 x86 enterprise Evaluation or a Windows10_TechnicalPreview_x32 iso. Does keyboard works? press shift F10 to launch command prompt. run diskpart, list diks, partitions and volumes. Assign a letter to 3.22 GB partition is necessary. And: did you export the windows key from first installed windows? May work, format c: and apply the instal.wim. As for a intermedia test: apply install.wim to a spare USB disk. 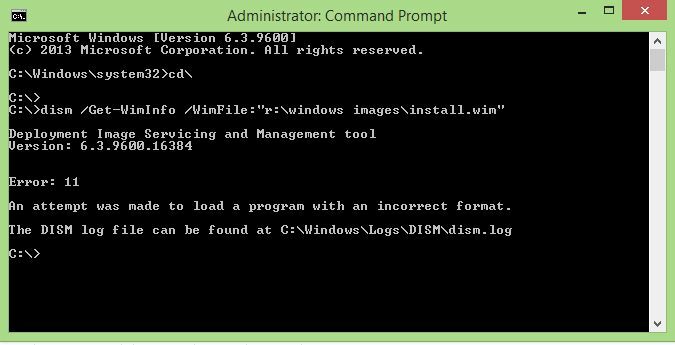 Dism WIMBoot is supported at Win 8.1 UP1. Use a current version to boot. Be careful to compare and adjust disk and partition numbers. did not boot into windows so i did no get a chance. The key is suppose to be in the meegopad stick preactivated. Wont activate win enterprise. You have to activate to get the 90 days. The key is suppose to be in the meegopad stick preactivated. The Win 8 Bing key should be stored at firmware. No idea about the MeeGoPad. Did you format c:? ProduKey reads offline windows and a BIOS OEM Key. Hopefully install.wim is readable still. Do you get a drive letter R: ? Partition 4 is now the selected partition . successfully assigned the drive letter or mount point. successfully assigned the attributes to the selected GPT partition. Where do I run this. Does exist a file install.wim at drive r:? Does exist a file r:\windows images\install.wim? Windows 8.1 Enterprise Evalutation dosn't support wimboot. Windows10_TechnicalPreview_x32 does support wimboot. Does Windows10 works at MeeGoPad T01? Can you boot windows 10 installation media from USB? As for testing: boot to OS selection, press shift F10, do not install windows 10. Edited by cdob, 17 March 2015 - 10:26 PM. .Think its the video driver thats shuting meegopad down. That's bad news. Is install.wim broken really? Does dism fails? Can you post last dism.log part? do not install windows 10. This would make it easier if you use it on a regular base at home. Will Try other applications and/or methods hopefully Friday. Not offtopic at all. Would save on constanstly pulling and inserting stick inputs. Measy U2C-D/Belkin Ethernet/USB 2.0 Hub combination: "Frankendongle"
Wonko approves of Frankenprojects . Clean installed win 8.1 with bing with some ones help. Installed and running Desktop watermark showing windows 8.1 with bing. Activated once Meegopad was online and restarted. Watermark is gone. Good news my friend, install drivers, do not install Antivirus at this stage, then follow this procedure: https://technet.micr.../dn621983.aspx and later this one https://technet.micr.../dn605112.aspx or ask cdob to help you make a new Boot Wim install.ini compresed image Windows way (using dism) to free several GB in your device, ask him if installing Office before making the compresed image can create any conflict with Wim Boot, if not it's a good idea to do it. I remember I read somewhere that when running an antivirus in a Wim Boot system, the antivirus extracts all files from the install.wim so you lose all the benefits from Wim Boot, even worst you end up with a full instaled system + a compresed image of it, so think about this. I have the drivers if you need any just tell me in order to upload it because can't remember the link. I'm thinking in buy a MeGoPad T01 so when I saw the drivers just downloaded them, think from a chinese dealer page about the device. I might wait for the Intel's version.